I was sent this movie to review and I think it has quickly become one of our family's favourite movies. It is nice to have a movie that we can watch with the entire family. The first time we watched it, it was a movie night with myself and the 3 younger girls. My 9 year old got a lot out of it, she loved how easy the story was told. When I asked her after what she thought about it, she said "I liked when the girl had a good expression, she felt bad that she was leaving New York and going to the country. The acting was very good. I also liked the animals, and now I would like a pet pig. The grandpa was pretty funny too." My 6 year old said that "I liked when the mom and dad got back together. And I liked the horse and the pig." The 3 year old, well, she barely sat still, which was expected! This movie is going to hit stores, nationwide, on April 5th. Your Love Never Fails (SRP: $19.98) is the touching tale of single mom Laura Conners, who has climbed the corporate ladder to achieve a high-powered career as an investment banker in New York City. But she struggles to reconcile her wish to spend more time with her 9-year-old daughter Kelsey with her heavy workload and the demands of her boss Paul. When her estranged husband Dylan files for joint custody of Kelsey, Laura must return to her hometown in Texas to appear in court. Her trip gets extended when the judge forces Laura and Dylan to try working things out on their own – and she must rethink her priorities and address her conflicted thoughts about the lifestyle, church and her own father whom she left behind years ago. With the help of the local minister Pastor Frank, Laura and Dylan find a way back to the commitment they made to each other and to Kelsey, and Laura realizes that what matters most in life is who you love. 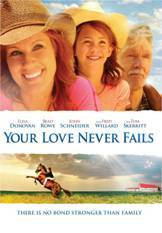 Complete with a healthy dose of humor and valuable life lessons all set against a captivating ranch backdrop filled with spectacular scenery and horses, Your Love Never Fails will win the hearts of audiences young and old. The endearing film is based on the song of the same name by Chris McLarney, which has received more than two million hits on YouTube. The stand-out cast in Your Love Never Fails features many well-known faces, including Elisa Donovan, Fred Willard, Chonda Pierce, Brad Rowe, Tom Skerritt, John Schneider, Tracey Gold and more! Disclosure - I received a copy of the movie to review and keep as a thank you for my participation. The opinions on this blog are my own. I would watch this movie with my children. 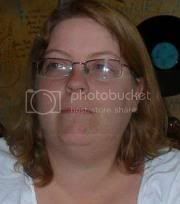 Hiya I'm your newest follower from the Boost Your Buzz Hop. Please stop by A Little of This and a Little of That and follow back. Have a super week! I would love to watch this movie with my family! You're right it is hard to find movies the whole family can watch! I like Your Love Never Fails on Facebook. I'm a new follower with GFC!